With respect to the Grands Crus of Alsace, there is certainly a premier, second and third division. In this hierarchy, no one is making a more rapid climb than Wineck-Schlossberg. This unrivalled development is due to the skill and dedication of (relatively) young producers such as Meyer-Fonné, Bernhard and Klur, all in Katzenthal. 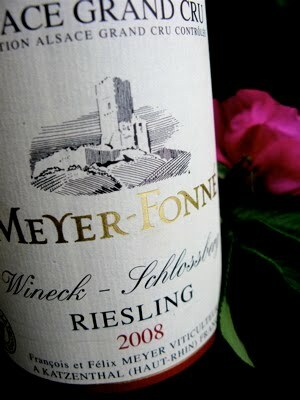 To addition to this group, others such as the likes of Paul Blanck and J.B. Adam make a very important contribution to the reputation of W-S.
2008 Riesling Grand Cru Wineck-Schlossberg from Meyer-Fonné in Katzenthal has superbly clean aromas of almonds, mango, smoke and minerals. The taste is medium-bodied, generous, and succulent with loads of mature fruit in addition to wonderful acidity and structure that leads to an extraordinary finish. My gosh! Price: € 13,50.